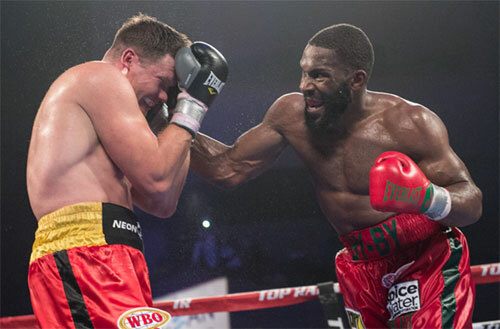 After a slow start, which included a fourth round trip to the canvas, North Philly’s Bryant Jennings, 24-2, 14 KOs, battled back to stop Hamburg-based Russian Alexander Dimitrenko, 41-4, 26 KOs, in round nine of the exciting main event at the new Ocean Resort Casino in Atlantic City. Super middleweight Jesse Hart also scored an impressive stoppage in his fight with Mike Gavronski. 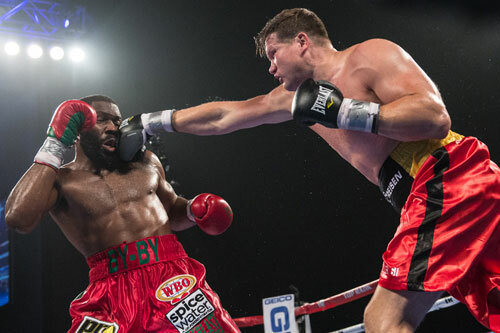 With the IBF-International and NABO regional title belts on the line, heavyweight Alexander Dimitrenko came out strong against Bryant Jennings in their scheduled 12-rounder. Fans of the typically slow-starting Jennings, didn’t necessarily panic as Dimitrenko used his size advantage (4 inches in height, 32 pounds in weight) and a long jab to take control of the bout, winning the first three rounds form a listless Jennings. 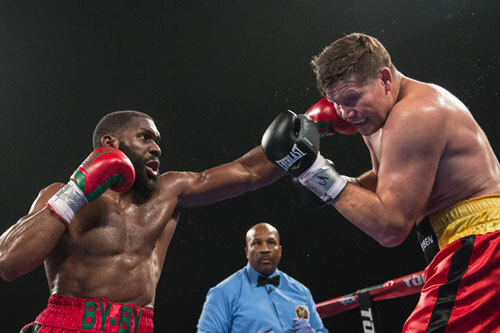 However in round four when Dimitrenko swatted Jennings with an arching right hand that sent Bryant down to the canvas, a twinge of panic zapped this particular Jennings fan. On one knee, Bryant grimaced and shook his head, clearly as angry at himself as he was hurt. Jennings climbed to his feet and returned to the fight. As it turned out, the trip to the floor apparently gave Jennings the jump-start he needed. From the moment he got to his feet, Jennings fought more aggressively, was more focused, and slowly but surely turned the fight around. 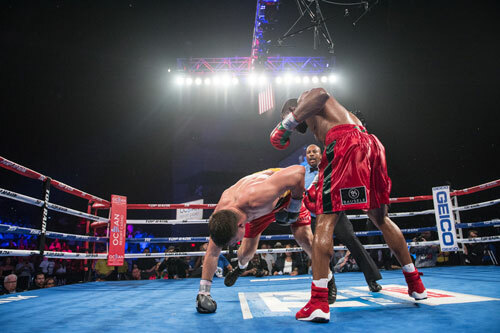 Beginning in round five, Jennings backed Dimitrenko up and landed far better than he had in the previous rounds. As Jennings surged, Dimitrenko faded, his strength and wind slowly leaking from his massive frame. By the seventh, it was clear that the giant was nearing exhaustion. In round eight, a sweeping left hook thumped Dimitrenko on the side of his head and the Russian tumbled to the canvas. He climbed up and gamely returned to the battle, but he looked drained. Jennings met him with a series of punches that battered Dimitrenko. Alexander tried covering up, but Jennings kept throwing and eventually Dimitrenko went down again. Dimitrenko survived the assault, got to his feet and made it to his corner, but clearly the end was near. His corner-men splashed the fading fighter with water and whipped a towel at him, but the bath and breeze did little to revive him. Dimitrenko came out for round nine, and Jennings jumped right on him. The beginning of the end came courtesy of a left hook that wobbled Dimitrenko. Jennings then drove a right uppercut through the Russian’s elbows that staggered him. Dimitrenko buckled at the knee before Jennings drove in another right uppercut that took his legs completely away. Dimitrenko sagged to the floor in a heap, and referee Allen Huggins waved the fight over at 1:56 of the ninth. Dimitrenko, who began to rise the moment he landed on the mat, complained that the stoppage was premature, as did a few at ringside. However, with more than one minute left in the round, Alexander’s chances of making it to the end of the round were highly unlikely. He was a sinking ship and Jennings was an unrelenting wave. The victory improved Jennings’ record, earned him two title belts, confirmed him as the leading American contender, and most importantly, kept him in line for a world championship fight. That opportunity however, may test Jennings’ patience. With Anthony Joshua and Deontay Wilder both engaged through the end of 2018 in separate bouts, and their own unification showdown penciled in for the early part of 2019, Jennings may have to wait for the fight he desires most. But in boxing, you never know. So, Jennings will no doubt return to the gym and stay ready in case something breaks. 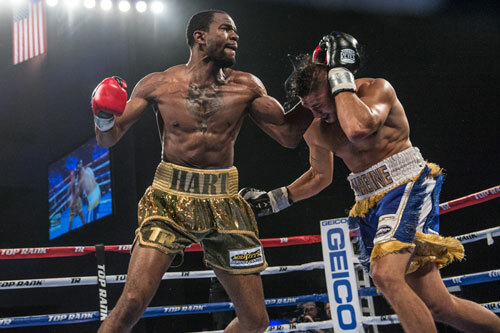 In a scheduled 10-round super middleweight fight, North Philly’s Jesse Hart, 25-1, 21 KOs, dropped Tacoma’s Mike Gavronski twice in round three and scored a TKO at 52 seconds of the same round. Jesse came right out, clearly in a hurry for the win, and just as eager to send a message to WBO champ Gilberto Ramirez, the man responsible for his lone loss as a pro. Hart looked strong and unruly in his hammering of Gavronski, sweeping the first two rounds on the strength of his constant punching and clean power shots. After one exchange, Gavronski came away with a bloody nick in his forehead. In the third, Hart ravaged his opponent with a right hand that sent Gavronski crashing down. When Gavronski got up, Jesse pounded him with another right that sent him down again, and also managed to slip in a left hook, just before he fell. The Tacoma fighter rose from the second knockdown, but when referee Eric Dali checked him over, Gavronski wobbled badly, prompting the ref to stop the one-sided fight. The time was 52 seconds of round three. 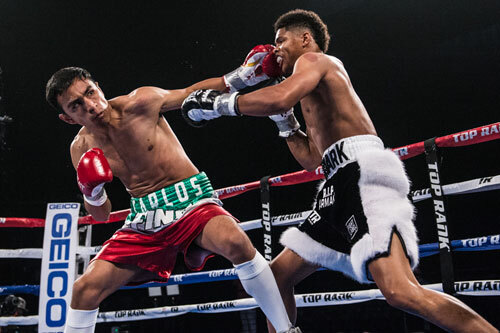 2016 Olympian Shakur Stevenson, Newark, NJ, improved his record to 8-0, 4 KOs, with a dull but one-sided unanimous 8-round decision over Mexican Carlos Ruiz, 16-5-2, 6 KOs. All three scores were 80-72. Afterward there were some rumors that Stevenson had injured one of his hands in the fight. 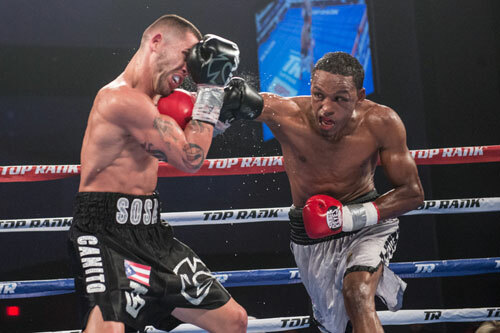 South Philly’s Christian Carto remained undefeated (16-0, 11 KOs) with an 8-round unanimous decision over tough Javier Gallo of Tijuana, Mexico (25-16-1, 13 KOs). This was Carto’s fifth win on points after the 11 bout knockout streak that opened his career. Although the outcome was never in doubt, Carto found himself on the receiving end of many clean shots from Gallo. Christian showed a good chin, but would be better served by a sounder defense. 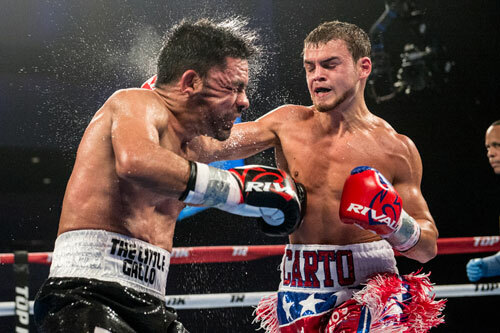 In the final round, Carto dished a terrible beating on his opponent, but Gallo was just too tough to fall. The official scores were a lopsided 80-71, 80-72, and 79-73. In an 8-round junior middleweight fight, Thomas LaManna, Millville, NJ, 26-2-1, 9 KOs, beat Matthew Strode of Marion, SC, 25-7, 9 KOs, by unanimous decision. LaManna started slowly, losing the first two rounds on my scorecard. But by round three “Cornflake” kicked into gear and took control of the fight. LaManna dropped Strode with a right in round five. Later, LaManna’s score tally benefitted from a one point deduction from Strode in the final round, when Matthew hit LaManna behind the head. 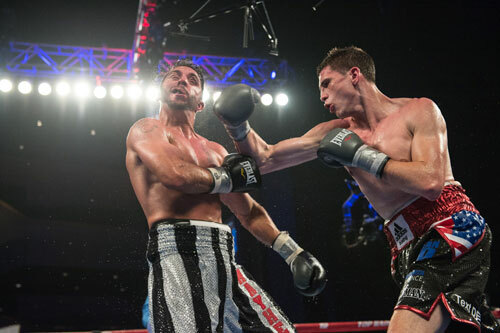 By the end of the fight, it was clear that LaManna was the winner. All three official scores were in Cornflake’s favor by a wide margin, 79-71. When the bell rings for a fight featuring Allentown, PA lightweight Joseph Adorno, you must be sure that you’re in your seat and paying attention. 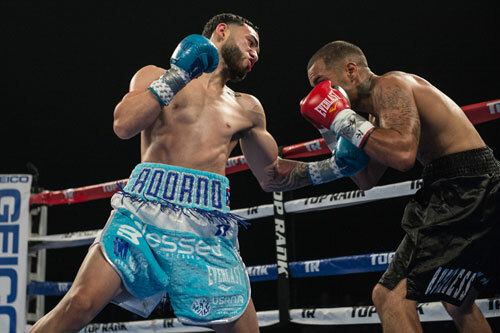 On Saturday, this again was the case when Adorno, 9-0, 9 KOs, came right out at the opening bell and fashioned another quick destruction, this time over Agustine Mauras of Lawrence, MA, 6-5-3, 3 KOs. Adorno, wasted little time finding Mauras with his deceiving power shots. The 19 year old swings effortlessly, but his punches have great impact and usually produce fireworks. He strung together a series of punches that landed on Mauras – left hook, straight right, left hook, overhand right – that softened his opponent. Then a moment later, lowered the boom with the series of shots that put Mauras on the floor – a pair of left hooks and a sledgehammer of a right. Mauras got up, but only lasted for one more flurry by Adorno. Referee Ronald Bashir stopped the contest after just 1:39. With his final outburst, Adorno had another win and another TKO. He appears to have much talent, but we won’t know for sure until he finds an opponent that can stick around to test him. Seven of Adorno’s nine wins have come in the first round, and he’s never been past the third round (TKO 2 & TKO3). In the opening bout at the Ocean Resort Casino in Atlantic City, heavyweight Oleksandr Teslenko, 14-0, 11 KOs, won by unanimous decision over Avery Gibson, 9-9-4, 3 KOs, in their 8-rounder. Teslenko scored a knockdown in the first round and won by scores of 60-54, 59-54, and 58-55. Perhaps the best fight of the entire show was saved for the last slot on the evening’s card, fittingly named the walkout bout. 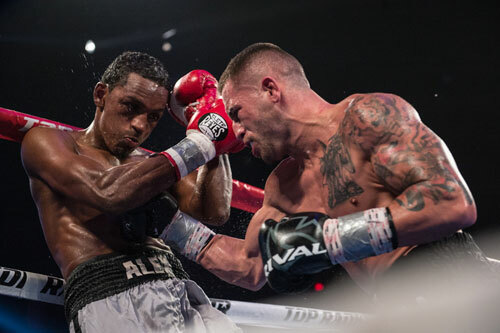 However, those who walked out before the 8-round slugfest between former WBA junior lightweight champion, Jason Sosa, 21-3-4, 15 KOs, and Reynaldo Blanco of Carolina, PR, 14-5, 8 KOs, really missed a thriller. When the opening bell sounded, only about 200 fans remained in the arena, the rest presumably in a rush to lose their money on the casino floor. Big mistake! Sosa, Camden, NJ, anxious to get started after his bout was pushed from the thick of the supporting card into the Twi-night of the post-TV action, came out in the first round and nearly battered Blanco into the ringside seats. Sosa swarmed Blanco and appeared on the brink of a quick victory. However, Blanco came to fight too. Beginning in round two, the pair waged a memorable war before the suddenly thin crowd. The action never ceased over the course of the 8-rounder, with the all-out war see-sawing back and forth. 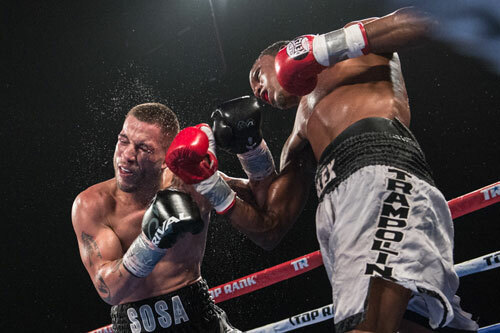 Although Sosa established and kept a lead in the fight, it wasn’t easy. 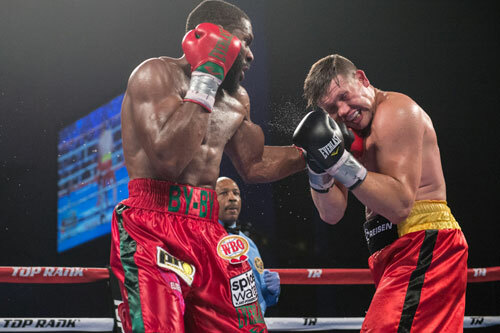 His steady stream of punches were repeatedly interrupted by jarring power shots from Blanco. In the fourth, Blanco had his best round, nailing Sosa with vicious right uppercuts more than once. However, Blanco also lost a point for excessive holding – a tactic he effectively used to keep himself in the fight when Sosa poured on the punishment. But this bout was no clutch-fest. With Blanco hooking and holding Sosa’s right arm, Jason would swing away with the left, until referee Ricky Gonzalez could break them. The one-point penalty was deserved. The pattern continued round after round in one of the grittiest and brutal fights in recent memory. 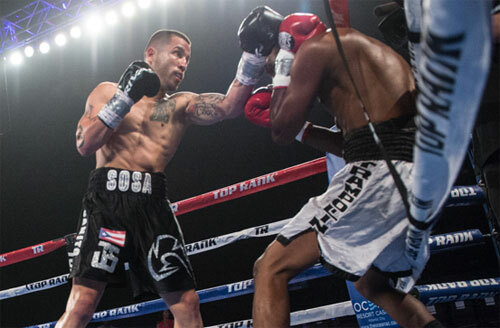 Finally in the eighth round, Sosa broke through and slammed Blanco with a left hook that finally dropped him. But Blanco got right up and went back in. Sosa drilled in a body shot that floored Blanco again, but once again, Blanco got up. The bell ended the fight and the night, and sent the die-hard fans home buzzing. 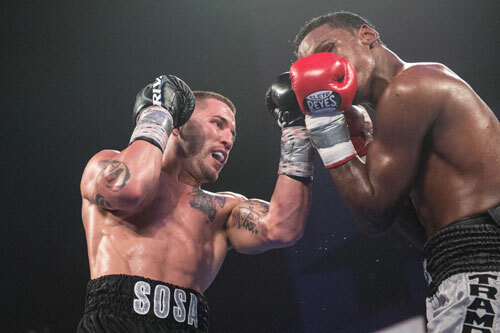 Sosa won the fight by official scores of 79-69, 78-70 and 77-72. My score favored Sosa 78-71. Despite the wide scores, this was a great fight. The old saying is, "If a tree falls in the forest and no one is around, does it still make a sound?". The answer on Saturday night was a resounding "Yes". 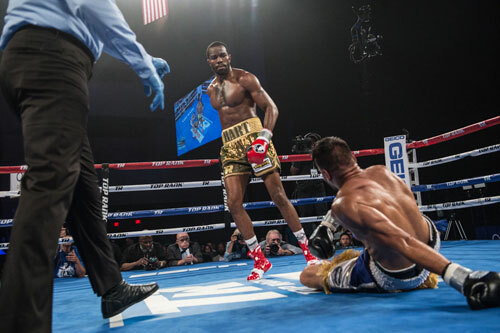 Top Rank promoted the eight-bout card that drew a crowd of 2,543 to the Ocean Resort Casino. 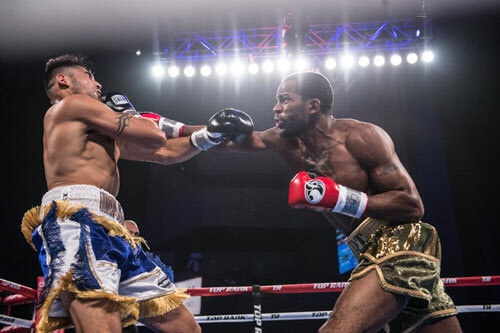 ESPN televised the two main bouts, while the rest of the card was shown on ESPN+. 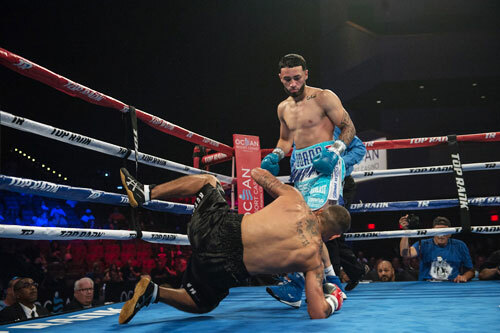 With this, the second big nationally televised boxing event at the Jersey shore in three weeks, fight fans are hoping Atlantic City has begun a resurgence. Only time will tell.